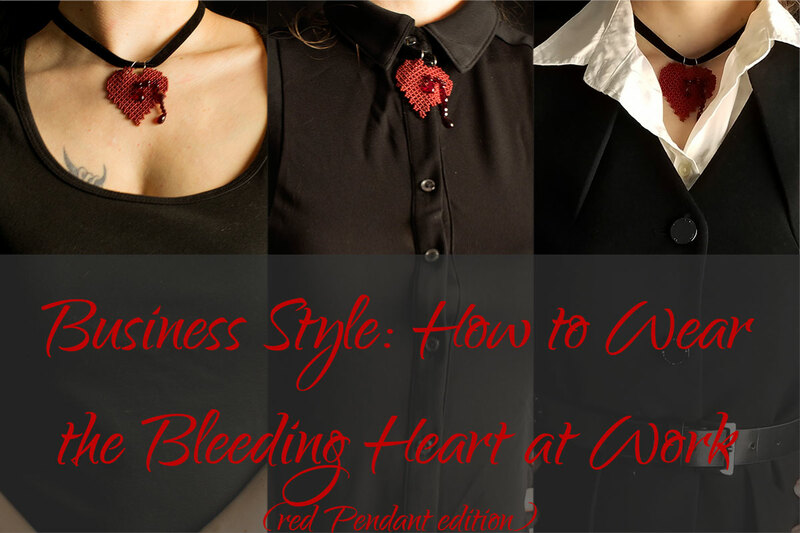 We’re on part 4 of my Business Style series, starring the red Bleeding Heart Pendant! If your workplace is too conservative for the black version of this pendant (featured in part 3), let me show you how to wear the red pendant instead. Even in its less obviously provocative version, the Bleeding Heart Pendant makes a discreet statement thanks to the shimmering blood drips made of deep red Swarovski crystals! To ensure that we’re on the same page, I’m following the dress code definitions from this article on moneycrashers.com. Your corporation’s particular dress code will likely be somewhat different. As usual, we’ll start with a Casual work outfit, then move up through Business Casual to Business Professional. We’re on part 3 of my Business Style series! 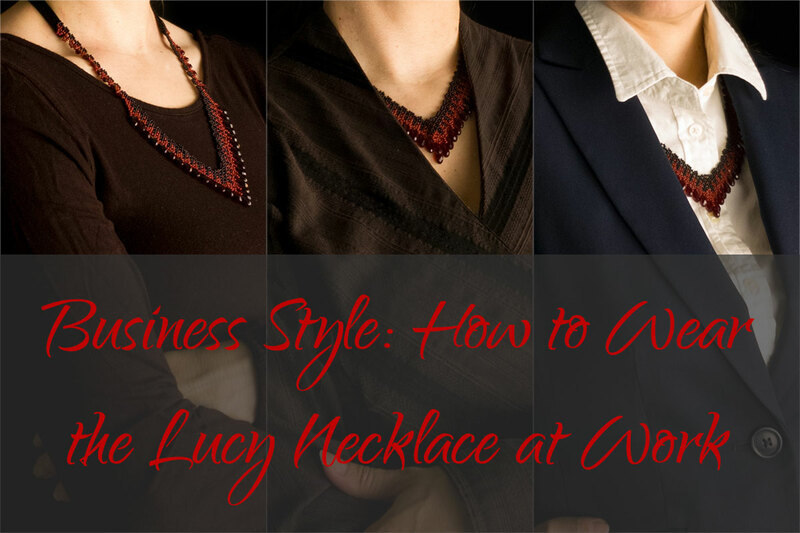 If you missed them, Part 1 featured my Carmilla Necklace, Part 2 my Lucy Necklace! 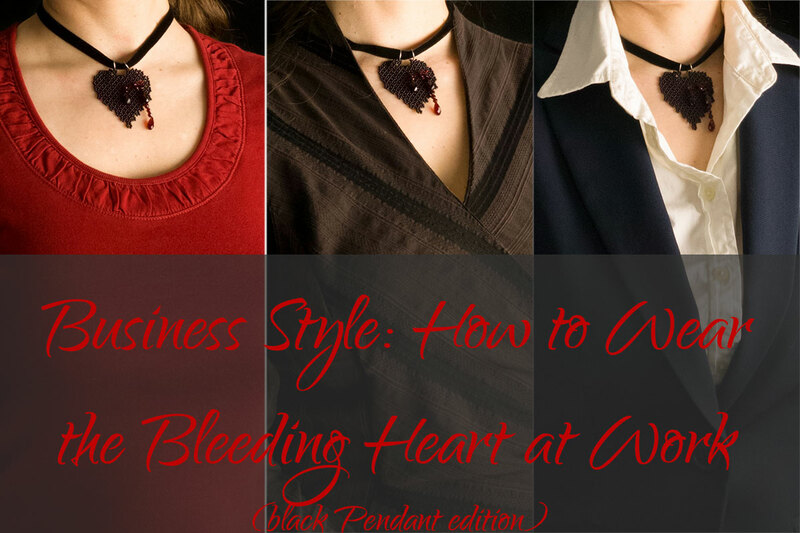 This time around, I’ll show you how to wear the black Bleeding Heart Pendant at work. As a discreet goth statement piece that can be worn with most necklines, the Bleeding Heart pendant is very versatile. A black heart is sure to invite some curiosity, so if your workplace is more conservative and you don’t want to attract too much notice, you can wear the red version instead. It will be featured in the next post in this series. Let’s work our way up from a Casual work outfit, through Business Casual to Business Professional. 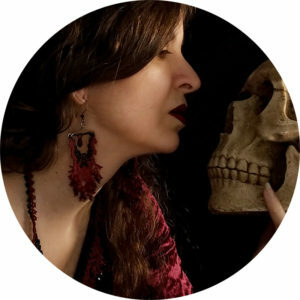 The old business style dilemma: Whether you’re a corporate goth—Hi, corp goth friends!—or not, you may wonder how my jewelry fits into corporate dress codes. After all, I promise that it will let you express your true self while still looking professional! 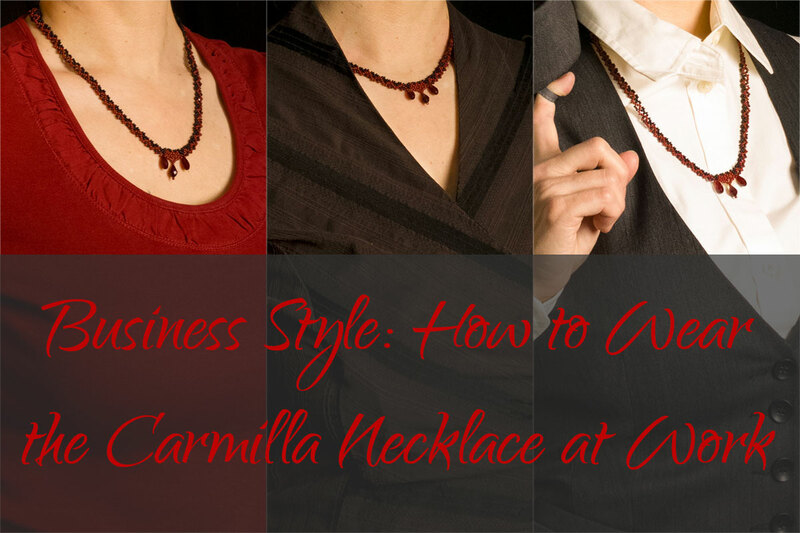 So here are a few examples for how to wear my Carmilla Necklace with Casual, Business Casual, and Business Professional outfits. To ensure that we’re on the same page, I’m following the definitions from this article on moneycrashers.com. Your corporation’s particular dress code will likely be somewhat different.